Any idea which trick this gaff belongs to or what's the use of it ?? Its a non expanded shell and "insert" with large hole in it. 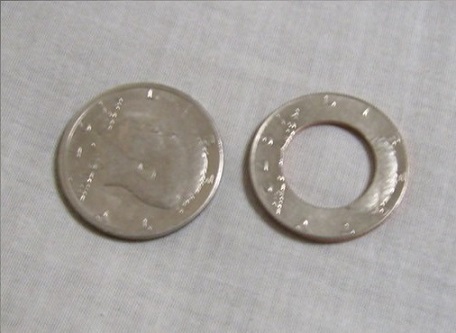 Looks like a karate coin, with a shell to hide the hole. My first thought was a finger through coin but never seen one that uses a shell. The hole is right size too. Are you sure they are part of a set and didn't just happen to be together? Got it in a job lot of coin tricks. This was a stand alone gaff that doesn't seem to go with any other gaffs that came in the lot. I can recognise all the other gimmicks apart from this one. Thinking a karate coin too. BTW, finger through coin IS a Karate coin! Joel Givens had a routine in Magic Magazine using a [ and a finger gimlet. I saw him perform it at a Magi-Fest way back in the 90s. I don't recall what issue of Magic, but hopefully this will be a jumping off point for those interested. Sleight of Hand Hobbyist since 1990. Happy you mentioned that Jamie, as I have never seen a [ for the Karate Coin, but I agree here with others that it certainly appears of that genre of effect, especially with the finger gimlet. It looks just like the one I made years ago and use to this day. Though the [ would help hide the whole, a better way to do this is by instead of using a shell, to just use another regular coin...That's the way I did it when I put out my Crimp Karate Koin, then that way you can actually hand out the coin if you want, or at least show it much more cleanly. Just my 2 cents!